To get started, from the Campaigns page, click the ‘Create a campaign’ button. Title: This is an internal reference label that only you will see. Language of Your Campaign: Choose the desired language. Select your desired Edition Mode. 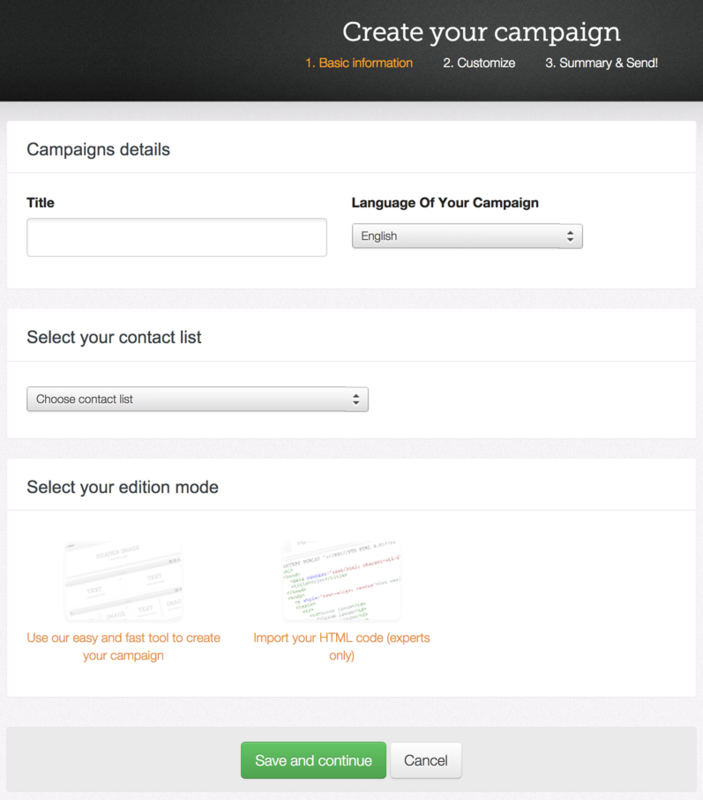 For this example, the ‘Use our easy and fast tool to create your campaign’ is selected. Then click the ‘Save and Continue’ button. Then browse through the gallery of templates, and select the one that you like. 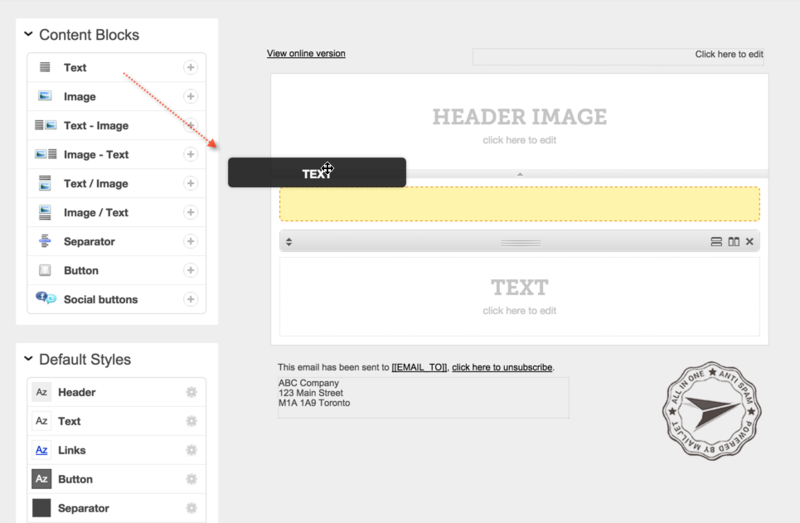 Here comes the fun part - designing your cool newsletter! Use our WYSIWYG (What You See Is What You Get) Newsletter tool to easily add new content sections or edit existing ones. Just “drag & drop” the desired content block. Click on the new block to edit. To upload a new file, click the ‘select file’ button, or enter the link to a hosted file. To add a hyperlink to the image, enter the full URL address in the ‘Link on image’ textbox. Click ‘done’ to save your changes. Click within a text block. 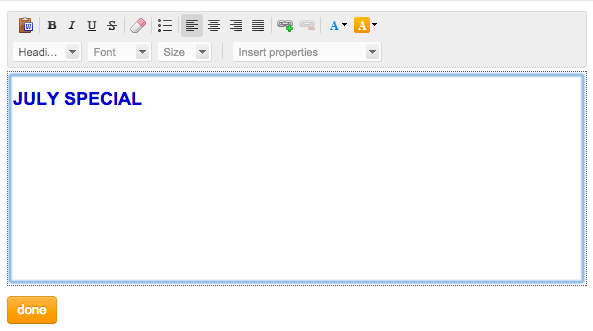 An text editor window will appear allowing you to edit the text, change font colours, alignment etc. Click ‘done’ to save the changes. At any point, you can send a test campaign to view how your campaign looks. Click the ‘Send test’ button. Enter an email address and click ‘ok’ to send the test. Once you have completed your campaign design, click on the ‘Continue’ button. Step 3: Summary & Send! 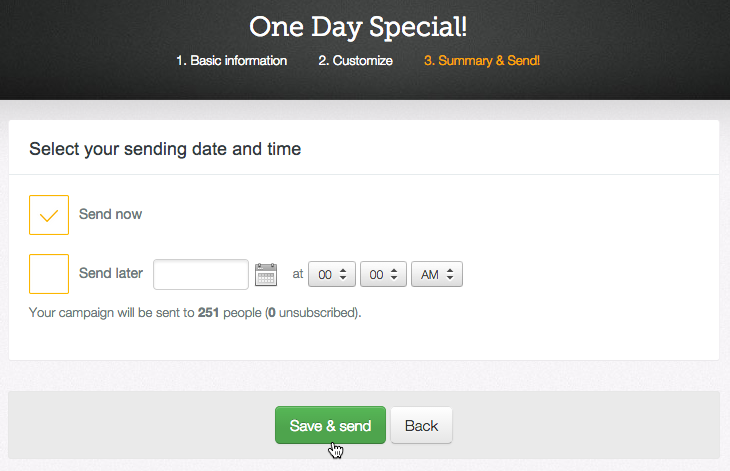 You can send your campaign immediately by selecting the ‘Send now’ option, or schedule it to be sent at a particular date and time. Then ‘Save & send’ button. Congratulations on creating and sending your first campaign!